← Win A Gift Box! 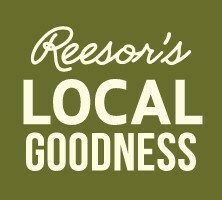 Please join us celebrating Reesor’s Market & Bakery’s 10th Anniversary this week! For our anniversary we are offering some of our most popular items for you to try at 20% off including our Spinach Lasagne, Ruthie’s Ruhbarb Coffee Cake, and McLean Meats preservative-free Black Forest Ham and Roast Beef. Our Annual Open House is Sat. Mar. 14. There will be delicious entree samples and baked goods for you to try, free coffee, revealing our new Morning Maple Loaf, and other surprises. Come join the fun! This entry was posted in Events, News and tagged Anniversary, Annual, Baked Goods, Baking, Cake, Celebration, Entrees, Events, Free Coffee, Fresh, making good food, Market & Bakery, Markham, Open House, Produce, Spinach, Stouffville, Toronto. Bookmark the permalink.